If you want to buy a Maple High School yearbook or sell your MHS yearbook, this is the place to do it. Just make a post below to find another person who went to school in Lompoc to make the trade. 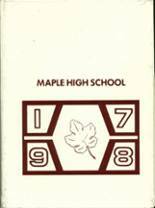 If you are an alumn of Maple High you should register now in the alumni directory. We also encourage you to interact with the rest of the alumni on this site. You can find old friends, share photos and stay updated on the latest school news.